I feel like the party is over. What I mean by that is my father-in-law has left and is probably back in Florida by now as I write this. We had a wonderful visit with him and our house seems so quiet without his presence. Our family loves to play games and while my father-in-law was here there was usually someone at the kitchen table playing some kind of card game. We will miss him, but I am sure that he will be back next summer for his annual visit. Plus this year Mike and I will be going to Florida to visit him in December… I can’t wait. So I guess that it is time to get back to more serious blogging again. While my father-in-law was here I did sneak in making one new recipe. We were having such hot hot weather and I wanted to make a light cool salad with some summer vegetables. 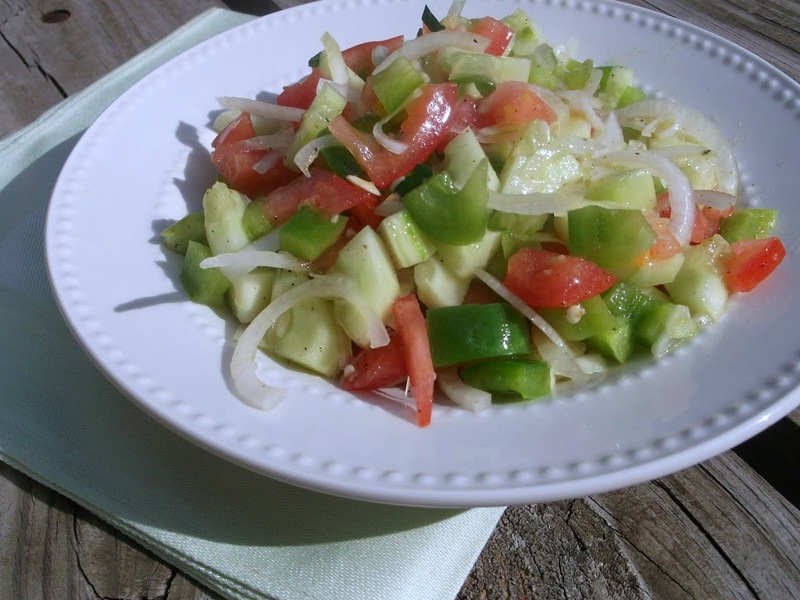 While surfing the web I found a summer salad that sounded refreshing and quick to make. It did call for champagne vinegar, which I did not have in the pantry so I decided to try the distilled vinegar that I had. I am sure that it did change the flavor of this recipe, but we enjoyed it just the same. But the vegetables were crisp and light; a nice simple refreshing salad for any meal. Has anyone heard of champagne vinegar before? When I was at the grocery store after making this salad I decided to look for the champagne vinegar so that the next time I make this salad that I could use that and see the difference that it made. I could not find the champagne vinegar at my local grocery store. So if anyone out there reading this has tried the champagne vinegar please let me know what the difference is between champagne vinegar and distilled vinegar. 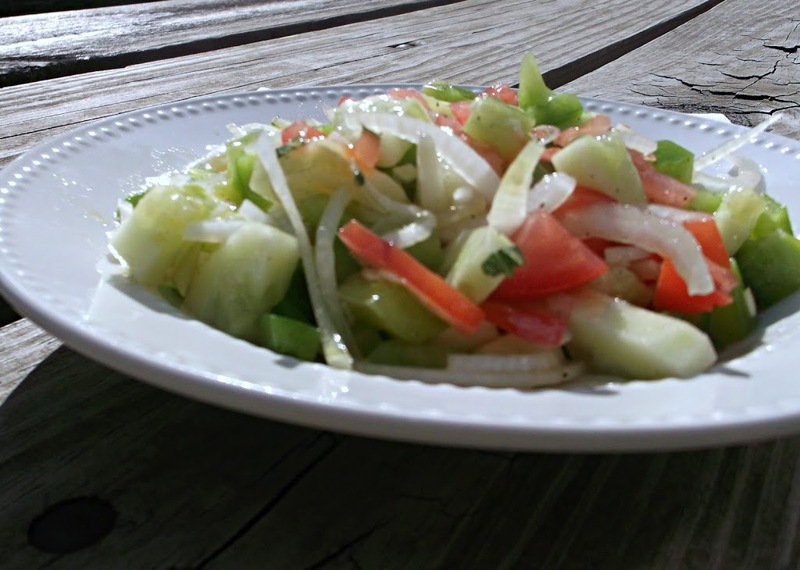 I hope you try this salad with the distilled vinegar or the champagne vinegar either way it is something that you will enjoy in the heat of the summer. Dressing: In a small bowl whisk together vinegar, sugar, oregano, salt, pepper, and extra virgin olive oil. Set in refrigerator to chill while cutting up vegetables for the salad. Salad: Peel and cut cucumbers into bites size pieces; place in a large bowl. Add green pepper that are cut into bite size pieces. Thinly slice onions and add to the bowl of vegetables. Dice the tomatoes and garlic and add to the other vegetable. Gently mix vegetables; pour the chilled dressing over the vegetables and mix well. Champagne vinegar is a very mild vinegar. A good substitute would be white wine or rice wine vinegar even though they aren’t as mild. I personally use rice wine vinegar often. Champagne vinegar tastes a lot like white wine vinegar. It’s nice, but I find white wine vinegar works just as well. 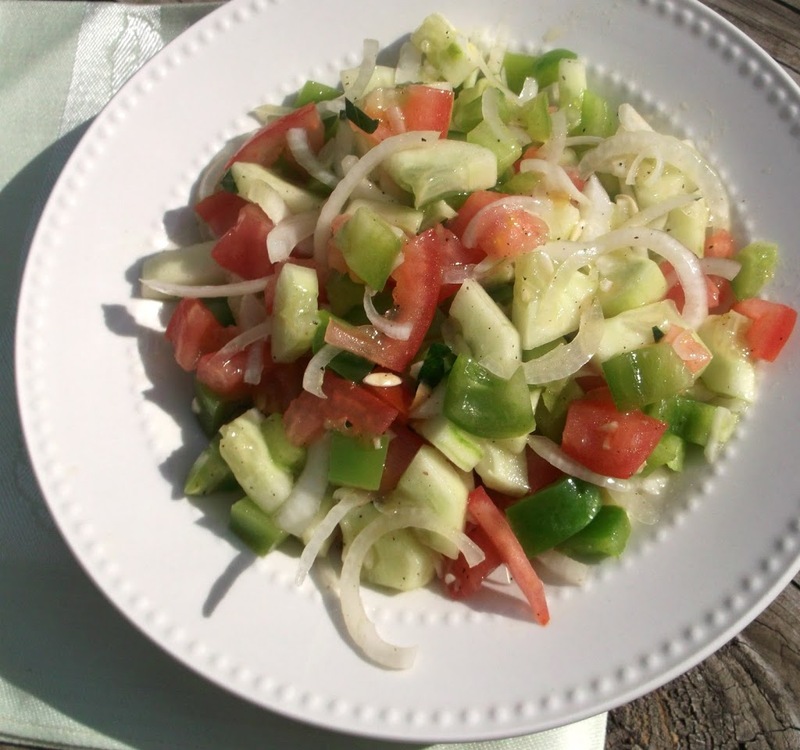 I’ve been making a similar salad to yours all summer, with the homegrown cukes and tomatoes we’ve been enjoying. I haven’t been using garlic, though, and wonder why I haven’t, since I enjoy its flavor so much. Nice post – thank you. Yummie, this salad sure reflects Summer…love how refreshing and colorful this salad looks.